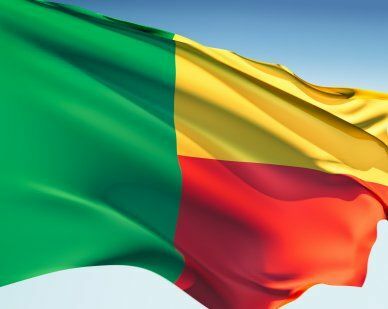 The Benin flag originated in 1959 and features a green vertical stripe and two horizontal stripes of yellow and red. When communists took over the country in 1975, the flag changed to a green background with a red star on the top left hand corner. When the Marxist regime fell in 1990, the old flag was reinstated. Green represents hope red symbolizes courage and yellow represents wealth. Our top-quality Benin flags conform to all official specifications. Emblems and designs are executed with the highest possible degree of accuracy in regard to detail, color shades, placement and proportion to flag size.